I've dragged this comment from Nail Sadykov to the main post. Nail says the Russian and Ukraine sailors have been designing inflatable sailboats for a while and the technology is advanced. "English language link, with several different models; From Boatdesign.net. And from a Russian forum. New Ukrainian boat. Possibly, next year in Everglades challenge or R2AK race. In ex-USSR existed a long tradition of inflatable, demountable boats, suitable for transportation by passenger train or other public transport." This year I did come across a rather forlorn, inflatable SUP, somewhat deflated, on a car roof rack. My guess is this particular boat owner assembled the SUP early in the summer, strapped it on his car for the duration of the summer months, and hit it with some air pressure when he wanted to use it. 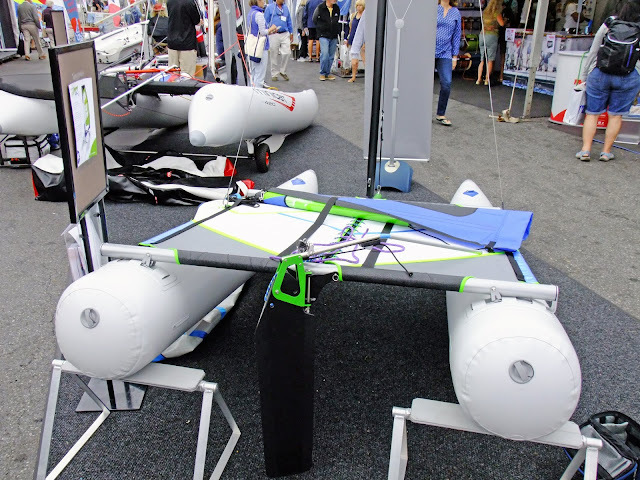 Seen at the 2018 Sailboat Show: the UFO. 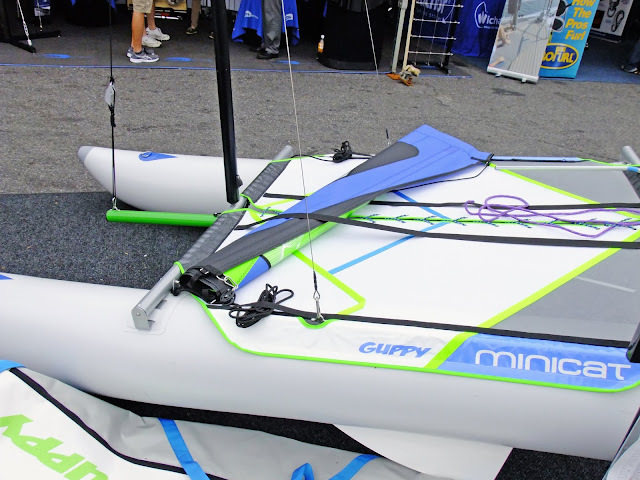 The sailing equivalent of the famous Kleeper kayak - good for a sailing fanatic who lives in a small apartment. Rather primitive boat if compared with modern inflatable multihulls from Russia and Ukraine or, even, with old Catapult. A link to the Russian, Ukraine designs would be appreciated. Thanks. New Ukrainian boat. Possibly, next year in Everglades challenge or R2AK race. In ex-USSR existed a long tradition of inflatable, demountable boats, suitable for transportation by passenger train or other public transport. One more small comment: these inflatable multihulls are mainly used as cruisers, not daysailers.